When I stumbled upon The Green Owl Cafe tucked away in the Atwood neighborhood I had no idea it would become my favorite restaurant in Madison. The Green Owl Cafe is the only fully vegetarian restaurant in Madison, and most dishes can be made vegan. Before I go on here’s a crash course on what veganism or vegetarianism is; Veganism means you don’t eat any animal products so that would include for instance dairy products, and honey (though some vegans are more relaxed about this). On the other hand, vegetarianism is only cutting out meat products. Okay back to the good stuff, the food. Where to begin? The Green Owl Cafe serves brunch, lunch and dinner. The only downside to their brunch is that it’s only served on Sunday mornings from 10 to 3pm. Brekkie Sandwich: This sandwich is vegan and reminds me of egg and sausage breakfast sandwich. It’s a definite must try! Devil Wings: This bursting with flavor vegan take on chicken wings will make you mad there’s only five per serving. 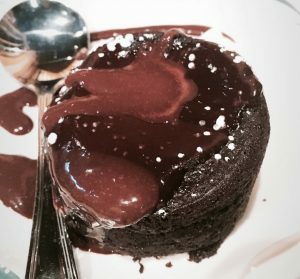 If you’re like me and have a major sweet tooth, also check out their chocolate lava cake and the cinnamon roll that literally (yes literally) will change your life or at least your day. It goes without saying but I’ll say it anyways, The Green Owl Cafe is a must for vegans, vegetarians or anyone who is looking for great food.